US, 1936, 92 minutes, Black and white. Bing Crosby, Ethel Merman, Charles Ruggles, Ida Lupino, Grace Bradley, Arthur Treacher, Margaret Dumont, Chill Wills, Keye Luke, Philip Ahn, the Avalon Boys. Anything Goes is based on the 1934 musical by Cole Porter, based on a play by Guy Bolton and P.G.Woodhouse and revised by Howard Lindsay and Russell Crouse. It was remade in 1956, but not staying close to the original play. There are quite number of songs by Cole Porter but also quite a range of songs by other composers, especially for Bing Crosby. 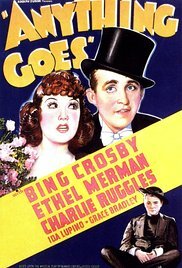 However, the film it is worth seeing for Ethel Merman, reprising her stage role, singing bits of Anything Goes but, especially, I Get a Kick out of You as well as a duet of You’re the Top with Bing Crosby. It is entertaining always to hear Porter’s witty lyrics and his skill at offbeat rhyming. The plot is slight, and more than slightly implausible. Ethel Merman portrays a cabaret singer travelling with her group to performance in London. She wants her friend Billy, Bing Crosby, to go but he has to stay to run the New York office. But, he is indecisive, is too late in leaving the ship and has to pretend to be a gangster in order to stay on board. He comes across a fake minister, a comic role for Charles Ruggles, a conman who is upset that he is only 13th on the Most Wanted list. Grace Bradley is his accomplice, Bonnie. There is a romance, Billy seeing Hope Harcourt dejected in the club, taken away by armed men – but it is revealed that they were private detectives hired to get her to come back to England for a wedding under the chaperone, Lord Evelyn, Arthur Treacher, a variation on his stiff upper lip Englishman, aristocracy this time not a butler. And he is attracted to Ethel Merman. There is romance, Bing Crosby finding all kinds of clothes and even shaving a dog for hair for a beard to elude discovery. It is surprising to see Ida Lupino in a very early role as the romantic lead. There is a singing group The Avalon Boys who have two numbers along with Chill Wills. And there is a moment with Margaret Dumont, taking time off from her Marx Bros films to do a similar kind of cameo performance. Surprisingly, the film was directed by Lewis Milestone who came to great prominence in 1930 with All Quiet on the Western Front and who was to have a long career with dramas, war dramas, and, eventually in the 1960s, Oceans 11 and the Brando Mutiny on the Bounty.